Now that I’ve had a few days at home, after five days in Indy for the PRI show, I think I have sufficiently decompressed from the trip to put it in perspective and compose some final thoughts. As all the guys told me for the past few years, it is a very special trip. And a big part of what makes it special is the people. When you’re together almost 24-7, chemistry is important, and these guys are all very different but the way they mesh together is amazing. I took the liberty of doing an amateur personality profile on each of them. Greg Anderson: Greg is very analytical, absorb information, process information, catalog information, prepare for the next influx of information. Greg doesn’t get very emotional, that doesn’t mean he isn’t touched by what he sees, just that he processes it logically and moves on. Greg is always thinking about the challenge ahead. Andrew Hines: Andrew is “Rain Man” he can recall everything and I mean everything. He can glance at the internet access code and recite it back three days later. He can tell you what the 330’ time was in Q2 for Eddie’s bike at Denver in ’09. We would be sitting in the restaurant talking about the trip home and Drew would know the flight number, boarding time and seat for each of us. Incredible. Eddie Krawiec: Eddie is a natural negotiator. He’s our “Guy” In New Jersey you have to have a Guy. Have you ever heard “I’ve got a Guy, call my Guy”? That’s Eddie. He got us into every airport lounge, and was always working an angle. A couple of times he was behind the counter switching seats and handling the check in for the group. He also wanted to ride everything and to fire every weapon that we ran across. Jason Line: Jason is a big kid. He is Curious George. He is also an Air Force veteran so he knows what these folks are going through. Jason probably took more pictures than the rest of us combined. He was also quick to strike up a conversation with either the natives, or the troops. And he is sincere; when Jason shakes your hand and says “Thank you,” he means it. I think he actually bought a goat in Arba Minch. I’m just glad he didn’t try to bring it home. Dan Runte: Dan is the classic Midwesterner. Big smile, quick handshake. But Dan is a stealth fighter. He will lay low until just the right moment and then pounce, with a one liner, or a verbal jab. Dan was the only guy who didn’t think some of the roads were bad. (Remember, he drives BIGFOOT) And he would happily recount highlights from his 25 years in the truck. What they share is a passion for those who serve our country. And a desire to say “Thank you” in a way that will hopefully be remembered by those they meet. The scheduled meet-and-greet appearances are very well attended, but not everyone at the bigger bases will be able to catch them there. 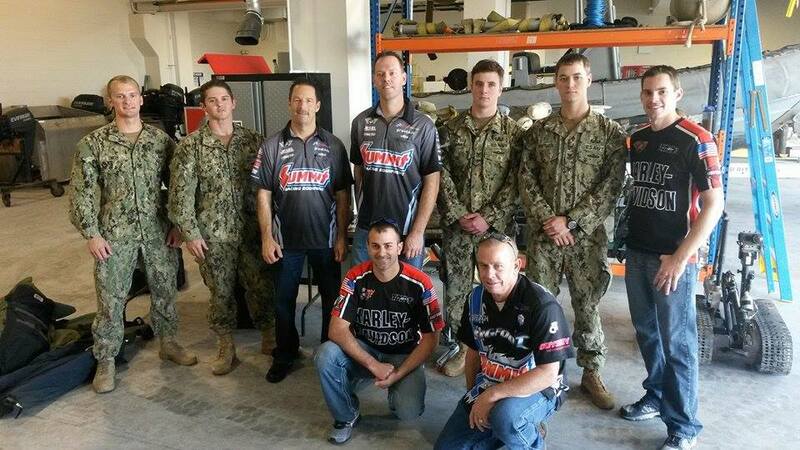 So the guys all wear their racing uniform shirts whenever we would hit the galley or the recreation area as an open invitation for the soldiers, sailors, airmen or Marines to come over and say hi. It is never considered an inconvenience or an interruption to put down a fork and chat with someone who stopped by the table. After all, that’s why we’re here. 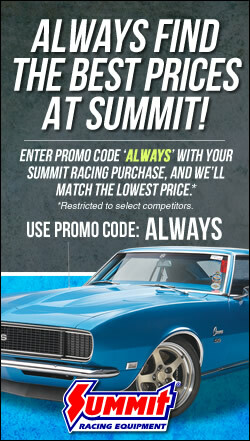 Many times we would enter an office only to be greeted by Summit Racing or Harley stickers and someone who had met the guys in years past, and continues to follow the racing action. The reconnections are special. As are the encounters with someone originally from the same area. In conclusion, it was quite the adventure. Accommodations that ranged from a five-star hotel to a mosquito-netted bed to a shipping container. Ground transportation that covered cars, trucks, vans, busses, Range Rovers, go-carts, and even a boat. Close to 50 hours in total flight time. Connections that had us hustling through the airport, and a couple of six-hour layovers. We had a little of everything. And it was worth every minute. It may sound like a lot of trouble, but when you consider the sacrifices that our service people make to keep us safe, it was no problem. And not a single complaint was voiced. These guys are very happy to be able to make this trip, and look forward to it every year. This year, I was fortunate enough to tag along. It will be something long remembered. Thanks for the invitation, it really was my pleasure to join you. Alan, you did a superb job of capturing the essence of this trip. I’m positive that the troops enjoyed every minute of it, and the drivers as well. Thanks for being the “scribe”, and a very Merry Christmas to you.